Plan Your Halloween Right! 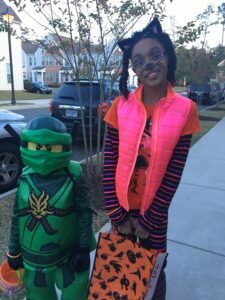 5 Tips for Busy Parents For A Flawless Halloween Night! The time is near for young ghouls, and superheroes to be knocking on your door. Are you prepared to hear, “Trick O Treat”? I know no matter how I try to plan ahead, it always seems to sneak up on me. In the end, I looked unprepared and my kids unhappy. Don’t let this be you this year. 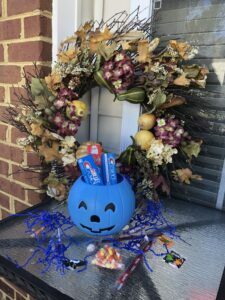 Here are 5 tips you will need to use to have the Best Halloween ever to keep everyone happy and healthy. Halloween always falls on a time where time is always an issue. In a perfect world, you’d wish it always fell on a weekend. Most of us will be rushing around because the kids will have school and you rushing to get home in time from work. As your kids what neighborhood you want to visit. Make this time to start asking your kids what neighborhood they want to visit. Check your local community pages to see if they are offering anything for the children like Truck O Treat. Set the tone early so your kids understand what they can expect that day. Such as, how long you are planning to be out for the evening, dinner plans, or if they are allowed to eat candy that night. This is a great time to remind your kids about healthier types of snacks they might be a great option for eating. Remind them they will be consuming lots of treats. I tell my kids to honor the Mom/Dad Tax. I plan on picking some of my favorite treats. Set the expectations, that they will be continuing their normal dental routine because it will be great for their teeth. For a great night of flawless Halloween fun start meal prepping a great dinner everyone will love. Think of easy dishes that your kids love but are healthier options since they will have unhealthy snacks later. I plan easy crock pot meals such as Meatballs with Pasta, One Pan Chicken and Veggies or Pulled Pork on Rolls. Or if you don’t have the time you can always order in for family favorites such as Pizza. 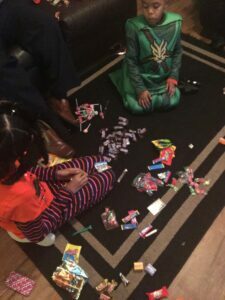 If your kids are fed they will be happy to walk around the neighborhood they picked to get their candy. Prepare your kids that some homes may not support giving out candy for Halloween for various reasons. 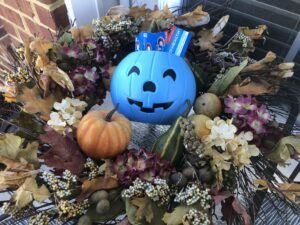 If you have kids with food allergies you may have heard of Teal Pumpkins. But some families are learning that some families like giving plastic rings, bouncy balls, Play-Doh or Pretzels. 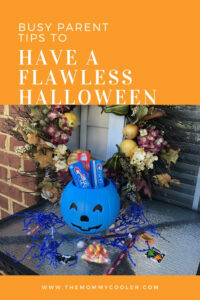 We want them to know that giving out candy or getting candy is ok, but these items last longer and are more fun. There will be many children out that evening, as parents your man concern is to keep your kids safe. Make sure you tell them about the rules of the road. They should have those glow in the dark lights and reflective clothing. Tell them if they get lost to set up a meeting point or have them carry a cell phone for emergencies. Don’t forget to pack the flashlight and have fun! Plan to get your items you are giving away. Don’t forget to stock up on your favorite family dental products, like Crest. Go and visit my favorite store, CVS for a great offer when you are shopping for treats this Halloween season. 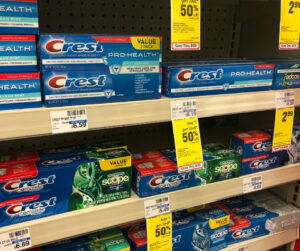 While shopping this week at CVS, you will have the option of getting Buy One, Get One 50% off any Crest toothpaste. Get your kids even more excited about brushing their teeth after eating all that candy! So much planning goes into one fun spooky night. You will look like a champion at the end when you prepare ahead to make your busy life seem flawless! 6 Tips to Get in Shape When You Have a Busy Family!